Is your car summer ready? Are you planning a road trip and need to make sure you’re okay? 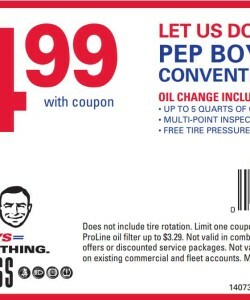 You’re in luck when you use this PEP BOYS CONVENTIONAL OIL CHANGE DISCOUNT COUPON. You can get an oil change at Pep Boys for $24.99! If you’ve kept up with car maintenance costs, you know this is quite a bargain. There are many other automotive companies that charge far more than that. One thing about Pep Boys – they are in the automotive business, designed to give your car the best car possible. You’ll be getting way more than just an oil change. They let you know if you need tires, belts and shocks and struts. It would be an advantage to know what’s coming up next for your car so you can budget accordingly. You don’t want to be stranded out there in the middle of nowhere because you didn’t know your car was needing to be serviced. So, now that you have this great coupon, you can use it and more. Pep Boys is a full-service facility, so they have everything you could possibly need for your car – or they can get it for you. It’s as simple as that. Licensed technicians, an air-conditioned building for you to rest while waiting, and great recommendations. You can also find other goodies such as mats, interior accessories for your car and even air freshener. They’ve tried to make it a one-stop shop for everything car. Kind of like a car mall, without the mall. At any rate, take advantage of this great offer. You’ll know your car is running fine and in tip-top shape. Remember, our cars are people too … kinda.